Casemet manufactures high-quality sheet steel structures and products with the modern manufacturing methods for the customers’ needs. We’re using several manufacturing technologies and extensive machinery to provide excellent delivery capability and competitive manufacturing cost level. Structures and products, we manufacture comes with the highest quality. 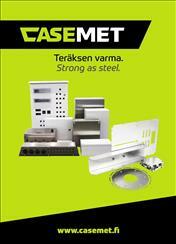 Casemet’s own design organization enables designing of special products and solutions.